I have long owned bull terriers. I have an American red nosed bull terrier named Jack. 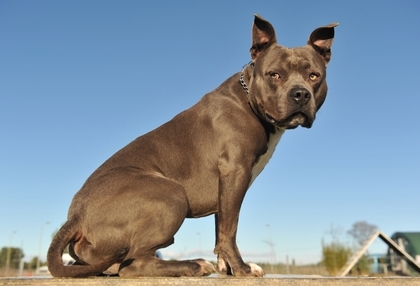 Commonly misnomered the pit bull, Jack is NOT a pit bull. Hes never been purposely fought, nor has he ever set foot inside a ring. No one has ever gambled on him fighting, nor is he allowed to fight. Jack is a BULL TERRIER. Period. And, as such, I think he could be a really good advocate for his breed. He always has lots of energy, he is super obedient, and he is always eager to please. Hes probably one of the best dogs any dog lover could hope to have. As I’m putting a site together for Jacks honor, called thelivingdog.com, I decided on a slogan. Because dogs deserve a life, not just an owner. I see it time and again, people just have a dog as a back yard fixture. There was this couple living on Whirlwind Trail in Round Rock, Texas that was a great example. They owned at least 3 Dachshunds, or sausage dogs as I like to call them. These dogs were uber frustrated. Never given any real interaction, they were just back yard ornaments. Something the owners can say Look at my dogs and pet them whenever the mood strikes. As a result these dogs were SO frustrated. All they ever did is bark. One bark was frustration, the other bark was anger, and another bark was the normal territorial behavior. During my brief stay next door to them I tried to set an example by playing lots of fetch with Jack in the back yard next door, but in the end they didn’t care. They ignored the dogs. How lonesome they must have been, how sad their existence is. I could hear stress in each dogs bark. What a sad way to live. Can you imagine never being allowed to leave your bedroom? That’s what it must feel like for those dogs. I was sad for them, but in the end it was a good motivator to stick with the program with Jack. I get Jack out at least once a day, and no less than 3-5 times a day I take him to the open corner lot for some high intensity fetch. He loves it, and as a result hes in great shape for 7 years old, and hes got lots of energy. Plus, hes not frustrated. Its a shame that everyone gives the bull terrier a bad reputation. Jack is very gentle. Hed never hurt a child under any circumstances, and hes even cat friendly. Heck, if you looked at the pics on thelivingdog.com you’d see hes even got a side car that is a small pup. Another male in fact, and yet Jack would dare not harm him. The American Bull Terrier is a working breed, and as such they love to have a job. Even if that job is frisbee (which Jack goes through several disks a month). If you don’t give them a job they will make one up, which usually consists of barking loudly at strange noises or digging to China. You can make a monster out of any dog, but if you socialize them well as pups, and constantly re-enforce boundaries with them, you’ll be a much more satisfied owner, and your dog will have a much greater life. My dog is my friend. I take him places. I don’t think he cannot handle things, I give him a shot at it. Since we’ve been together so long now, Jack responds to my guidance in the form of negative tone disapproval. Basically a growl nuh-uh at him, and he is quick to come back into his boundaries. Dogs are social animals, and want to lead the pack so they will always test their boundaries. You have to lead them, not follow them, or you will lose your authority. When you define a boundary for them, you have to stay with it for life. Health is an important factor too. In fact last year Jack contracted a deadly form of skin cancer. Hes recovered now, but it took some surgeries and a lot of money before he was all healed up. In my eyes it was worth it.